Your little girl will be so happy when she finds out what she gets to be for Halloween. Every year you look for the cutest things to dress her up in. Last year she didn’t really like the kitten costume you got, she complained of being too warm. And that she didn’t have a pretty dress. She has gotten to that age where she wants to be pretty. She wants to wear dresses, but only ones that have tutus. She wants to be able to spin around, and see the dress twirl around her. She wants a cape to wrap around her. A hood to cover her head. And most of all she wants to be able to play pretend, to be able to become someone else in her pretty clothes. 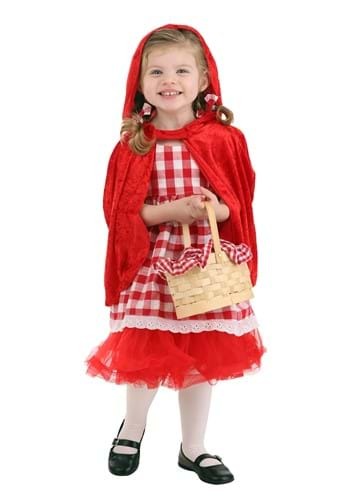 This year she will be able to do all the twirling, and pretending she wants in this Red Riding Hood Tutu Costume. And most of all she will look so pretty in the red, and white checked apron dress. All you'll have to do is teacher her how to say "Goodness, Grandma, what big eyes you have." After she says that to your mom, then she can run around in her Little Red Riding Hood outfit. Don't forget to pick up a little basket, she will need something to carry all of her goodies in on her way to Grandma's house. Let's just hope she doesn’t run into any big bad wolves along the way.